Features: 3 in 1 smart product combines a mop, polisher and a scrubber, all in one. Interchangeable microfiber material fitted on two high power rotators at 250 RPM makes cleaning easy. Cordless design makes cleaning your house a breeze. Take it with you anywhere. Rechargeable Li-Ion Battery. Quick 2 hour charge will give you 30 minutes of usage. Ergonomic Handle lets you clean without bending over or struggling to clean under furniture. 330ml Water Tank and Spray pump lets you fill the tank with any type of liquid cleaner or polishers. Removable and Washable Microfiber mop heads. No need to buy replacement disposable that are expensive. 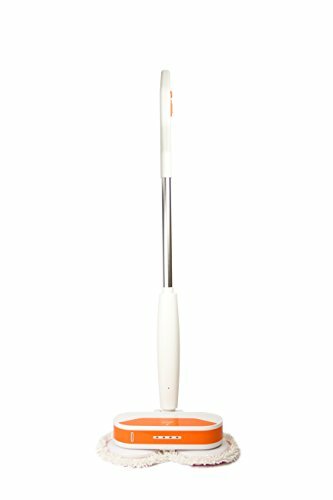 ★ULTIMATE ELECTRONIC SPIN MOP & POLISHER - Elicto spin mop is the revolutionary and new replacement from old mops to clean your floors to look shiny and flawless. This innovative wireless mop will deliver the best clean and make the daily cleaning process a breeze; simply fill 330ml water tank with your chosen cleaning solution, press the on button and watch how it cleans rotationally and polish the floor! ★RECHARGEABLE - This extraordinary mop comes with a built-in 2200mAh durable rechargeable battery that has the capacity to clean your floor for 30 minutes. The cordless design allows you to clean every single corner of your house, even reaching the hardest spots where is impossible to pass the mop. When you are done cleaning, simply connect the cable charger and will take a minimum of two hours to charge completely. ★100% SATISFACTION GUARANTEED!. We are confident that you will love your Elicto mop, but if you are not satisfied, our products are always backed by 100% Money Back No Question Asked Guaranteed! If you have any questions about this product by Elicto, contact us by completing and submitting the form below. If you are looking for a specif part number, please include it with your message.